This thread is an attempt at a comprehensive list of the most advanced techniques used in Marble blast. This will also include some useful information about glitches and other stuff in the game that can help you get better times. Wall hits are generally used for getting up to a higher level, and to simply switch direction 180 degrees. It is important to note that your spin is what gives you your height from a wall hit, your speed does (pretty much) not affect wall hit height. This makes it impossible to effectively wall hit off a wall made out of space/ice/any low friction surface (unless you only wanted to go backwards, in that case low friction walls are better since you don't get that annoying extra height). You can of course change the spin of the marble whilst approaching a wall by jumping and holding a direction in the opposite direction you're going. You will notice that if you go at a high speed and jump whilst slowing down, your spin will change very quickly, but your speed won't (slowing down is best done by not jumping). So you can, on some levels, do wall hits that don't give extra height pretty easily. Trivia regarding movement: The movement is based on where your camera is supposed to be, not where it actually is. If you get close to e.g. a wall from behind, then your camera won't go through the wall, it will adjust so that you still look at the marble even if it has to zoom in to a ridiculous extent. We all know this. The point is that the WASD buttons act as though your camera went straight through the wall, meaning that you can click W+A and still go straight forward if the conditions were the right ones. First of all, a good startup is done by landing on the start pad right as the voice says "GO". This is the fastest way to leave the start pad. Version 1: automatic startup. This is the easiest of all "good" startups; it is done by starting a level, and as the level starts, you simply let the marble do a bounce, then as the marble lands after the bounce, you jump. Repeat that (i.e. you let the marble bounce followed by a jump again). Then you just jump until "GO". Version 2: manual startup. This one is simply timing. You can either start jumping right as "SET" appears on screen, (note: this means that you have to prepare for it, you basically need to jump on the very frame "SET" appears on screen) or you can start jumping later, so that you only do one jump before the timer starts. The first one is slightly easier to do, but the second one is ever so slightly faster because you do fewer jumps (everytime you land on the start pad during the start sequence you will lose a little bit of your spin). Version 3: the start pad trick. The idea here is to not jump away from the start pad, but landing on the slanted part of it instead. The recommended way to do this: firstly, you kind of have to do the manual startup on this one since the automatic one is just a wee bit too late. Secondly, instead of jumping as the timer starts, you just bounce instead, and make sure to not go diagonally all the time when doing the bounce as you will go to far and not land on the slanted part if you do that. Instead, you should, just as the timer starts, simply let go off the WASD buttons for a fraction of a second and then keep on holding them down before you hit the slanted part. You don't wanna hit the slanted part whilst not holding down a movement button. note: you only do the "let go for a fraction of a second" part if you use diagonal movement, if you only use one movement button, you can hold it down all the time. You are recommended to use diagonal movement here though as it is faster. Version 5: The Dushine tweak. If you cannot see what's so special about that video: He lands higher up on the slanted part before he starts jumping than we used to do; a very minor tweak, but hard to do properly. Version 6: The Kalle tweak. I found out that if you do a natural bounce (I will talk about what a natural bounce is later in this thread) instead of hPerks' tweak, you go even faster. Note: This tweak does not work for Time Trial as you go too far after the natural bounce. You will either hit the Time Travel from above (and thereby grabbing it later than you would if you grabbed it from the side) or simply miss it completely. Also, one can probably devote an entire section to different types of starts. Matan has an old video of 14 different starts. Three others that I've used are below. Key: JF = Jump on Flat part of the start pad, JS = Jump on Slope of the start pad, BF = Natural Bounce on Flat part, BS = Natural Bounce on Slope, RF = Roll on Flat part, RS = Roll on Slope part. The "noob" fast start: The pattern is (JF, JF, JF, JF, JS). Press and hold jump from before the marble first reaches the start pad. Then you can hit the side of the start pad (you may need to slow down very slightly or you might miss the start pad entirely) and bounce off with a lot of momentum at the cost of a slower overall start. A very similar start is (JF, BF, JF, BF, JF, JF, JS). The start pad roll: The pattern is (BF, BF, BF, RF, JF, JF, RS) including the initial natural bounces when the marble spawns. Do the same thing as the start pad trick, but do not jump on the side of the start pad, instead, roll on it and onto the ground. Then you can start jumping at a different point, which can be used to your advantage. The delayed start: The usual automatic start is (BF, JF, BF0, JF, JF, JF), but one can delay it by a more or less precise amount by adding extra natural bounces after the first jump. You can add one (BF, JF, BF0, BF1, JF, JF, JF) or two (BF, JF, BF0, BF1, BF2, JF, JF, JF), and even add a short roll (BF, JF, BF0, BF1, BF2, RF, JF, JF, JF) (the numbers have been added for clarity). These delays slow down the start but are useful if you want the marble to jump at a precise position after leaving the start pad. Rolling off the start pad: Sometimes, it's faster to simply roll off the start pad, especially with a delayed roll, i.e. you don't start rolling until right before GO! This is faster for no jump attempts as well as levels where you need to turn or stop shortly after GO! This works because the spin you can reah during the start sequence is too much for the marble speed (i.e. zero) and the start pad friction, so the marble starts sliding and some of the 'energy' is lost. Higher frictions allow for more spin at the start. One of the most difficult things to master when you're a new player is the spin of the marble; you will often think that you have made a jump, only to find out that you were spinning too quickly when you hit the ground, anf thusly going straight out of bounds. If you want to have controll of your spin when landing you simply need to play more and get better at the game, no shortcuts here. Noteworthy: If the marble spins too quickly, it will severly lower your friction. That's why slowing down and jumping at the same time is a bad idea: if you go at a high enough speed, it doesn't matter what your spin is, you will simply "slide" on the surface. 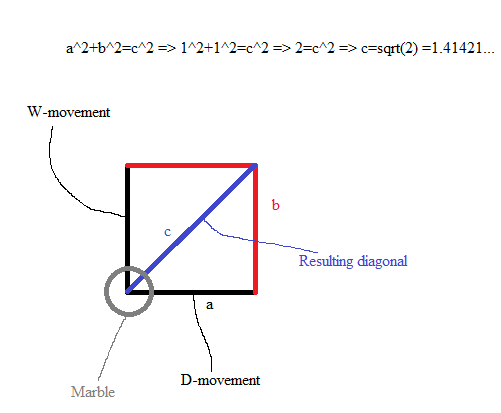 So if you are jumping whilst slowing down, you marble will turn around and start to spin the other way, but you don't actually slow down because the short time that the marble has contact with the surface it will simply slide off. Spin in the air: We need to note that there is no air in this game, this means that your spin in the air does not affect you movement in the air, only what buttons you push matter here. So if you wanna fall straight down, it doesn't matter if your marble is spinning like crazy (except for when you hit the ground). Important to note here: spin in the air can only increase for a few seconds, then it maxes out. This is different from how it behaves on ground, where there appears to be no upper limit to how fast the marble can spin. This isn't very apparent in normal play since you never really travel very fast on ground, and when you do want to increase your speed quickly, you jump. This means that you spend most of your time accelerating in the air. Use this to your advantage when you are in the air; remember that once you've reached the maximum spin in the air, you can keep going in that direction without the fear of building up an insane amoun of spin. This means that you can often easily land safely after being sent way up in the air by overshooting your target a bit and then fixing both your spin and your position by going back the other way before you land. Trivia: The lack of air also means that if you create a level big enough, you can accelerate indefinitely. And due to the fact that solid objects have continuous hit detection, but triggers don't, the somewhat funny "glitch" on Matan's Internal clock race 3 can happen. i.e. you bounce off the start pad without finishing the level because you don't stay in the trigger for long enough. There are several different textures with different friction in the marble blast series. Here is a list of the most important ones. * The game claims that space has no friction, but it actually has 1% of normal friction. ** Water is a special case as it was designed to not give you any bounce at all, no matter how high you fall from. *** The random force has a friction of negative 1, this means that it is actually not random - it just forces you backwards. Your friction will be lower as the surface you're standing on is tilted at a higher angle. You have no friction if you stick to a wall, that's why you stick to it and cannot get away from it unless you hit another surface (or use a powerup). The natural bounce (named by Dushine) was known about by many players for several years, but it didn't have much of a use until I started to abuse the trick, most noteworthy is my start pad tweak that was mentioned previously in this post. Bu there are other uses as well. First of all, how do you perform the natural bounce? Simple: you just let go of the WASD buttons as you hit a surface, and that's how you do the trick. Note: this can be done on walls and ceilings as well. Why is it useful? The thing about the natural bounce is that you will bounce where you normally wouldn't. For example, if you go really fast on the floor, take any long straight level and just go forward whilst jumping, you will see that after only a few jumps you can land on the floor without bouncing. This is because of your speed.If you go at a high enough speed you can land on a surface without bouncing. However, if you try to do the same thing again, but this time you let go of WASD before you hit the floor, you will bounce. That is a natural bounce. This means that in some situations where you want a bounce, but you're going too fast to get one, you can use the natural bounce to get a better jumping pattern. Take a look at Pascal's record for Spork in the Road, at the end when he uses the super speed, he gets a bad jumping pattern, but he uses a natural bounce to get a smoother pattern and can jump in to the goal without slowing down too much. Why does it work? To be honest, we don't know the mechanics behind it, and I don't really care enough to find out. Go yell at HiGuy to figure it out. The natural bounce and friction. This needs to be talked about since this is why my start pad tweak works. The thing basically is that not only does the natural bounce let you bounce where you normally wouldn't, but it also eliminates the lack of friction (that I talked about earlier) that happens at high speeds. So you also get more friction by doing this. So if you build up a high spin on your marble during the startup, the spin/speed ratio will be unnaturally high the first few seconds; so if you do a natural bounce instead of hPerks' tweak, you will artificially increase your friction and thusly saving a frame or two. All items with a hitbox actually have two hitboxes: One is the rotated hitbox, and one is the actual hitbox. The rotated hitbox follows what you see, for example: a super speed looks quite long and thin, and so the rotated hitbox is also long and thing and it encapsulates the super speed model. This hitbox is irrelevant. The only one that ever matters is the actual hitbox. This is also true for your own marble. The actual hitbox works differently depending on what it is, for powerups and gems they are staionary and unchanging. This is why you can grab a super speed without touching it, and also touch it without grabbing it, because the actual hitbox of the super speed is an elongated cuboid, meaning you can stand close to its center on one side but not the other. The marble's hitboxes. As stated above, the marble also has two hitboxes, but unlike the hitboxes of items that seem independent of each other, the actual hitbox of the marble is completely dependent on its rotated hitbox. The rotated hitbox of the marble is the smallest possible box that can encapsulate the entire marble, this hitbox can turn freely in any direction, however the actual hitbox works in a different way. That hitbox never rotates in any way, it only changes size; and the size of the actual hitbox is the smallest box that can encapsulate the rotated hitbox. This means that, since the actual hitbox never rotates, it changes size as the marble rolls, and can expand and compress several times every second. What is the maximum size of the actual hitbox? If we assume that one side of the rotated hitbox is equal to one "unit of length" (ul), then the volume of the rotated hitbox is always 1*1*1=1 unit of volume (uv). So to get the maximum sized actual hitbox you calculate the diagonal of the rotated hitbox, which is Sqrt(sqrt(2)^2+1^2)=1.73, so the volume is equal to 1.73^3=5.196uv. This is why you can grab stuff through walls. If you want to delay the grabbing of a power-up in your way, be it an inventory one or a non-inventory one, you can simply take a screenshot. This is only really useful for when you want to delay the activation of a gravity modifier. Mines are not items in the hitbox sense. They activate when you hit the actual mine, and not a hitbox. NOTE: Since late 2015, screenshot glitches are not legal in WRs and will not be accepted in WRRs. The screenshot mechanic has subsequently been changed by HiGuy so that it can't be abused in PQ, but still allows you to take screenshots. All of the tricks do however work in vanilla MBG. The screenshot glitch is by far the most abusable glitch in the game. It is done by pressing ctrl and P at the same time. This saves a screenshot in your marble blast folder for whichever game you were playing when you took the screenshot. I recommend you to delete screenshots unless you wanna save them, otherwise they just take up space. If you cannot find them in your folder, just search for "screenshot" and you should find them. Taking a screenshot causes the game to lag, which you can use in several ways which I will talk about. But first you ought to note that the higher your resolution is the more lag you'll get from your screenshot. I've found that 1024x768 is a good resolution for taking screenshots. Note, you can take several screenshots in a row, but it can give you the music glitch, or even crash your game. Note: If you crash your game you will lose all records you broke during that session. I have never managed to keep them after a crash at least. Restart screenshot glitch: This one is performed by taking a bunch of screenshots (4 or 5) in quick succession right as you click the restart button. I usually take a screenshot, then click restart, then take 3 or 4 more screenshots. This will cause moving platforms to be earlier in their path than they normally are. this is obviously useful on som elevels, but on others, Great Divide Revisited for example, you are dependent on the normal cycle and therefore it is not used on these levels. Trivia: All platforms are always in the same position when you start a level in marble blast, except for the lift on Money Tree, which roughly half the time is activated immediately. This doesn't affect normal gameplay, or even speedrunning it as it is back down in the time it takes you to get the gem and go back to the lift. If the restart screenshot glitch is done, the lift will never activate before it should. Out of bounds (OOB) evasion: As said earlier, only the actual level has continuous collision detection, not triggers, this includes the OOB trigger. So you can avoid going OOB by taking a screenshot as you pass the OOB line. This is of course used more in platinum than gold, and even more in custom levels where several OOB triggers on the stage is common. In MBG, this trick only has one usage (Hoops). If you are unfamiliar with this trick, you can try it out on Teleport Training (Platinum beginner level) by simply starting the level normally, and then when you are above the goal, just fall down and try to time your screenshot so that you take it just as you hit the OOB trigger. If done correctly, you should just fall straight through it. It might take a few attempts to get the timing right though. Trivia: you can spam screenshots as you are falling of a level and thereby delay your failure. I don't know for how long this is possible, but you can go on for quite a while if you time your screenshots correctly. Same goes for sections of a level inside an OOB trigger; you can play "normally" when taking screenshots and jump around and whatnot. Extra speed from mine: Pretty simple, you take a screenshot as you hit a mine, and you will be exploded away at a much higher speed than normally. The effect increases if you take more screenshots at once; but don't go crazy taking screenshots when you hit a mine, because there seems to be a sweetspot. Two screenshots at 1024x768 was the best I could do, if I took more than that the explosion became smaller than it would've been without taking any screenshot in the first place. Extra fact about mines: You also get extra speed if you hold space when you land on a mine. This doesn't always work though, for unknown reasons. Taking a screenshot will also give you extra height if you hit a platform moving upwadrs while you fall down on it, or if you edge hit the platform from the side. This is in my opinion the hardest screenshot trick to time correctly. "Sticking to the wall trick". This trick is not really understood by the community, but it does have a few usages. What this trick does is simply: If you stick to a wall when fall down, or going upwards, you will fall faster (if you go down) or gain more height (if you go up). Please keep in mind that when you stick to the wall, you are stuck to it as well*, meaning the number of situations where this is useful is reduced a lot. You can jump off any surface with a normal dot product less than 1, or simply put, any wall that is not perfectly vertical or slanted inwards. This means that, even if a slope is very steep, you can still jump off it. This used to cause wallbug in MBP 1.50 Beta 3, as the gravity was a fraction of a degree off, making one face of walls ever so slightly not straight. Since the walls were seen as 89.9999 degrees (less than 90), you could jump off them. Note: You need to be holding down any of the WASD buttons when you try to stick to a wall, otherwise you will do a natural bounce and slow down yourself in the process; which can also be used on a few levels. Inconsistencies: I have an Internal Clock (IC) that is pretty much equal to Pascal's, (I'll talk about IC lower down in the post) and thusly our times on IC levels are pretty much equal. And there is a level that is both an IC level and it uses wall-sliding, namely Free Fall. Pascal had the WR for years with a 6.66, and out of the 3 cylinders, he used two of them to gain extra speed. I did the same thing and got the same time. But then I tried to only use one of the cylinders to gain extra speed, and I managed to get the exact same time again. So somehow I got the same speed boost by using one wall, as when I used two. A trap-launch (TL) is a very advanced trick used to mainly to skip large sections of big levels that don't have gems. It is done by placing the marble between a moving platform and a staionary one, or between two moving platforms. You also have to place the marble at the very edge of the platform so that you son't get stuck. A good level to try this out on is Great Divide (revisited). Place the marble on the edge of one of the platform so that the next platform will hit you from above when you are still on the lower one. If done properly, you will see the marble flying away at great speed. If you have trouble understanding what I mean, take a look at the World record rampage, this trick is used several times. Randomness. When doing TLs, it might seem pretty random where you're going and at what speed. The truth is that is actually isn't random. You can even increase your chances of successfully doing a TL by adjusting your position. For example, if you wanna go form the lowest moving platform of Great Divide to the very top of the level by doing a TL, you will need to place your marble as close to the edge as possible. You pretty much need half of the marble to be off the platform. This will make it possible for the marble to be shot quickly enough, and at a high enough angle to make it to the top. This, however, does not mean you can get a TL every time. Having a setup only increases your chance of a successful TL, it is not a guarantee. In fact, the vast majority of your attempts will be failures. Props to Whirligig for explaining all of this to me. The reason you go higher when you use two super jumps is because they add to your velocity. Anyone who remembers physics or calculus should remember that position is velocity integrated (s(x) = ∫v dv = 1/2 v²). Because of this, changes on your velocity have a quadratic (x²) effect on your position. Since using a Super Jump adds to your velocity, then the height gained from using two would be roughly 4x the original height (2² = 4, thus 4x). This applies to jump, blast, and super speeds in a similar method: they all affect your velocity thus their impact is quadratic. I don't have any exact numbers for multiples (ask Whirligig, he'll probably give you way more info than you ever wanted). When using a super speed in the air, it will base its direction on the last surface you touched while also taking camera rotation into account (in fact the super speed also does this while the marble is still touching a surface). This is how some super speeds send you almost completely upwards: example 1 , example 2 . Since the camera rotation is taken into account, turning it around 180 degrees in the two linked examples would have sent the marble downwards, rather than upwards. - Great Divide Revisited: You do a different startup by simply rolling off of the start pad and then start jumping as you hit the floor. This lets you edge hit a moving platform, which gets you closer to the Time Travels. There are a couple of tricks (and techniques) that can only be performed with the Mega Marble. The most obvious and most useful of these is the small boost given when you activate the MM. It allows you jump three/four-trim walls if you activate it at the right time. The downside on this is that lag can cause the MM to activate after you want it to, and this trick requires exact timing. The last thing I'll mention here is the fact that you can be off to the side of a gem by 1-2 marbles and still grab it by activating the MM, as you expand from the center rather that just straight up. Note from Kalle: The spin launch is quite easy to overdo, so be careful when doing it. However it does allow you to perform spawn abuse tricks, which i will talk about right below this entry. Checkpoint Abuse is done when you go on to do other tasks after hitting a checkpoint, then gets respawned back to the checkpoint (by falling out of bounds or pressing the respawn button* [only in MBP 1.50]) and continue the level. Note that hitting a checkpoint also saves the powerup (if any) that is in your inventory at that instant, and you receive that powerup every time u respawn on the checkpoint. This provides a great aid to the task that you wish to do when performing the checkpoint abuse without losing the powerup when u continue the level. In Matan's example, his super speed allowed him to catch the TMs even faster. Note from Kalle: Spawn abuse. Spawn abuse is kind of the multilpayer version of checkpoint abuse. In multiplayer, you will (most of the time) start close to where you fell off. This can be abused if you are on one side of the level, and the gems spawn on the other side. You then simply use a powerup, SS for example, and quickly go across the entire level. Make sure to touch a part of the level when you get to the other sidem because where you spawn is based off of where you touched the level last. The thing with spawn abuse is that you don't need to slow down when you get to the other side, just simply fall off and you'll be back up on the level in no time. 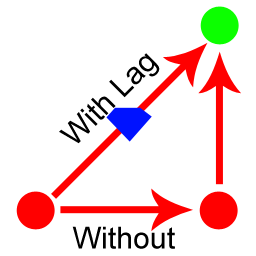 The cyan boxes are the bounding boxes, and the actual collision boxes. The purple boxes are the rotated shape bounding boxes. Multiplayer has this interesting behavior that your marble is completely controlled by your game, not the host (unlike MBU, it's what makes MP smooth even if you're lagging). As of such, the game checks for collisions between your movement positions. This means, if you have a laggy connection, you may "warp" through gems that you otherwise would not have gotten. Your marble travels to the green location, by rolling along the "without" path. Because of lag, the intermediate position (bottom right) is not sent, and the server only gets the update from bottom left to top right. As of such, it appears that you have traveled through the blue gem, even though you missed it completely. As far as I know, this has never been abused, nor would I recommend trying. The screenshot glitch with gems uses the same principle, and it was removed for this very reason. Last edit: 14 Feb 2015 03:29 by HiGuy. HiGuy to the rescue. If you wanna write something about the last thing as well you are more than welcome to as you know it better than anyone. A remarkably comprehensive list! I see some points of vagueness or error though, there's definitely still room for improvement. Checkpoint Abuse is done when you go on to do other tasks after hitting a checkpoint, then gets respawned back to the checkpoint (by falling out of bounds or pressing the respawn button [only in MBP 1.50]) and continue the level. List everything you see that needs improvement so we can fix it. edit: I added an image to diagonal movement and tried to make it easier. also, can someone confirm that Rug, carpet, sand and water all have a friction of 6.0 so I can remove that question mark? Last edit: 14 Feb 2015 16:59 by Kalle29. Last edit: 14 Feb 2015 18:26 by HiGuy. If I recall correctly, sand and water have friction 4.0 and tarmac has 0.7, but the last time I checked was many years ago and I can't find the game file that gives the friction values right now. I'll make a chart of many different starts soon. Last edit: 14 Feb 2015 19:27 by HiGuy. Locked the topic so it doesn't get trolled, spammed or have useless posts in it. If anyone wants to contribute, pass it through myself or higuy and if it's good, we'll unlock for you to post. Removed IC from the list of included topics. This is because IC is not actually a technique, it's based on what computer you're using. It is also somewhat random, for example: you can have the best IC on one level, but not even close to the best on others. We don't know why this is so I'm simply not including it. A good IC on one level usually means that you have a good IC on most levels though. Last edit: 18 Mar 2015 16:49 by Kalle29.